July 1, 2016 - If you are looking for a vegan comfort food dining experience, look no further than Paisley Vegan Kitchen, which opened in March of 2016 on Brevard Avenue in Cocoa Village. The owners, Alyssa and Michael, explored the concept of presenting delicious vegan cuisine that mimic the familiar dishes we all know and love, such as chicken and waffles, lasagna, and macaroni and cheese. According to the owners, a not so familiar dish, buffalo cauliflower bites, is a customer favorite. Completely free of all animal products, all menu items and ingredients are made from scratch daily, including the chicken substitute. When Alyssa and Michael began to outgrow their on Delannoy Avenue, they immediately set their sights on Cocoa Village as the new location for Paisley Vegan. “Cocoa Village was the most welcoming place we found while looking for places,” says Alyssa. Hitting the ground running, Paisley Vegan Kitchen opened a month and a half after Alyssa and Michael signed the lease for its new location. The restaurant currently has seven employees. Alyssa and Michael’s future plans, include investing into the physical infrastructure to make the kitchen as efficient as possible, and eventually relocating into a larger space. For more information about Paisley Vegan Kitchen, visit www.paisleyvegan.com or stop by its new location at 630 Brevard Ave, Suite A. 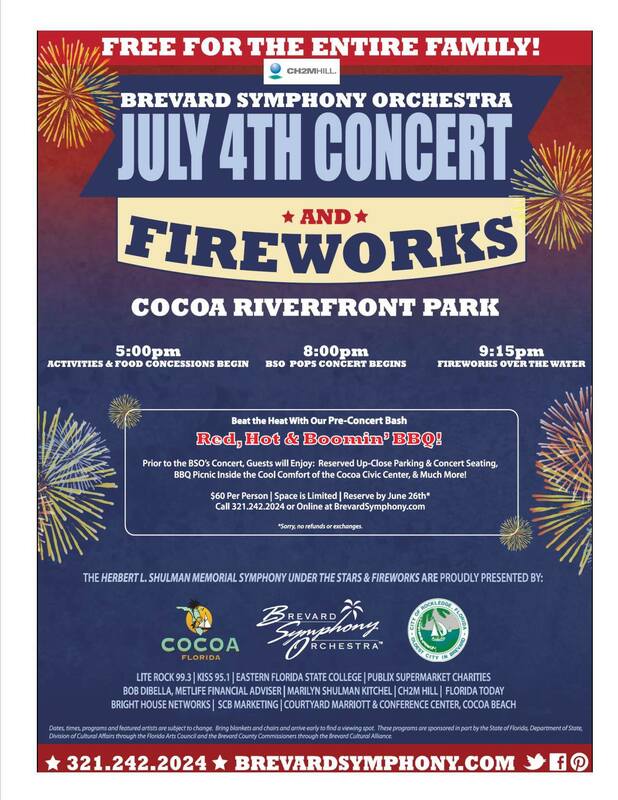 Each July 4th the cities of Cocoa and Rockledge celebrate the Independence Day Holiday with a free concert from the Brevard Symphony Orchestra and a beautiful fireworks display over the Indian River. Thousands gather to celebrate this holiday commemorating the adoption of the Declaration of Independence, declaring freedom from Great Britain. We are quite lucky to have such a fantastic show, which makes Cocoa's July 4th celebration the premier Independence Day Celebration along the Space Coast. For the last six years, we have partnered with two other Space Coast shows to bring you three days of fireworks along the Space Coast, Smoke on the Water and Fire in the Sky. (http://www.visitspacecoast.com/event/smoke-on-the-water-&-fire-in-the-sky/16359/) This fantastic partnership brings you three days of fireworks displays along the Space Coast with the first show in Port Canaveral on July 2nd, then a show along the beaches in Cocoa Beach on July 3rd and the finale, fireworks over the Indian River in Cocoa Village on July 4th. 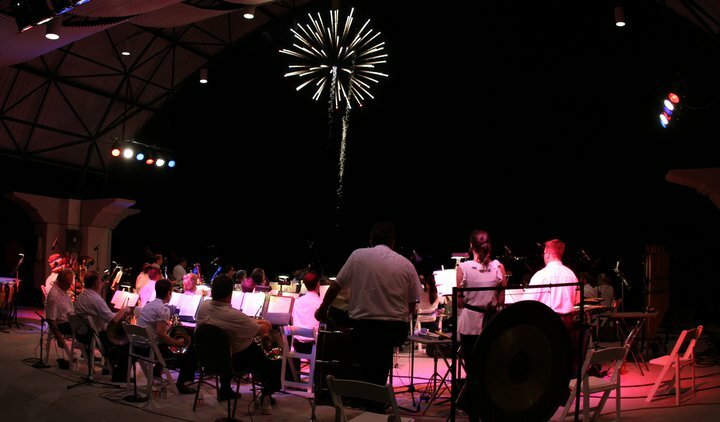 Thousands of people come to Riverfront Park each year to watch a free concert by the Brevard Symphony Orchestra as they play along with the beautiful fireworks display over the Indian River. The concert begins at 8pm and the fireworks begin at 9:15pm. This year there will be plenty to do in the park prior to the show and fireworks, so come early to reserve your spot. 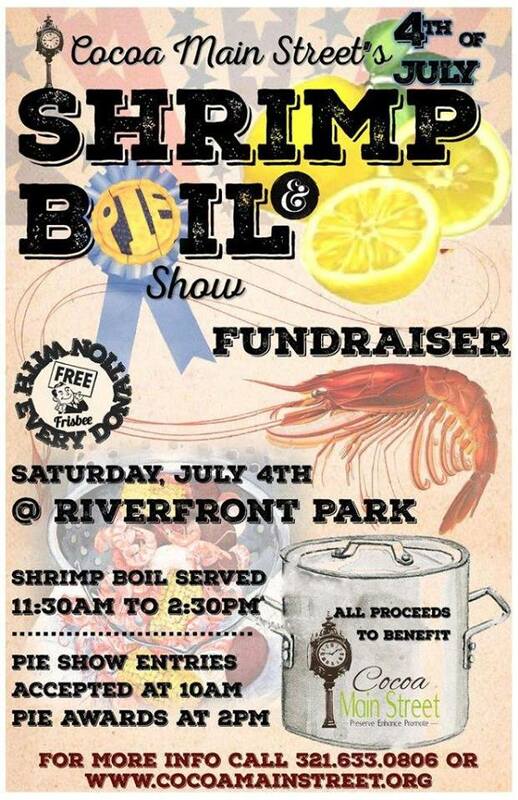 Beginning at 11:30am, Cocoa Main Street will be hosting a Shrimp Boil and Pie Show. This unique event allows you to sample some awesome food and award winning pies. Then beginning at noon, the kids play area will open which will have bounce houses and slides. Food vendors and Magic Dove balloon artists will begin at 4pm. Don't forget your blankets and lawn chairs! I have been attending the July 4th celebration in Riverfront Park for many years and I recommend getting there early to reserve your spot as space goes fast! This is the premier event for a reason! So enjoy your Independence Day holiday weekend and remember come out early to the park to reserve your space and enjoy all of the early festivities in the park! When should I arrive to find a spot to view the concert and fireworks? I would recommend arriving around 11:30am to reserve your space and enjoy the Shrimp Boil and Pie Show hosted by Cocoa Main Street. What time does the Brevard Symphony Orchestra concert begin? The concert begins at 8pm. What time do the fireworks begin and how long do they last? The fireworks display over the Indian River begins at 9:15pm and usually last about 20-25 minutes. Where can I find parking? All along the streets in Cocoa Village and the municipal parking lots will offer free parking. Can I bring my pet with me to this event? Even though Cocoa Village is a pet friendly community, we do not recommend bringing your animals to this event due to the amount of people in attendance. Thousands of people will be at this event and some pets do not like large crowds or loud fireworks. So for this event, leave your pet at home. Service animals are always welcome. Can I bring alcohol to the park? NO. Alcohol is not permitted at this event and there will be Cocoa Police patrolling the event. There are several bars and restaurants throughout the Village that you can patron for an alcoholic beverage. Will there be food available at this event? There will be food vendors set up at the event where you can purchase food beginning at 4pm. What happens if it rains? The show will typically go on unless it is raining pretty bad or there are severe weather threats. The Orchestra is covered but their equipment cannot get wet, so they will play depending on the direction of the rain. The fireworks cannot be shot with high winds and rain. Keep an eye on the city's Facebook and Twitter page to get up to the minute weather notifications if needed. Is there special assistance for individuals with disabilities? If you need special assistance based on a disability, contact Lisa Moody, Leisure Services Manager at lmoody@cocoafl.org or (321) 635-7701 and she will try and assist you as best she can. Can I fly my drone to capture video of the event? Drones and aerial photography systems are not allowed without prior authorization. Contact Lisa Moody, Leisure Services Manager at lmoody@cocoafl.org for more information. Will I be able to sit on the boardwalk in Riverfront Park to view the fireworks and concert? Yes, but the boardwalk will close and be cleared out at 4:30pm in Riverfront Park. Wristbands will then be distributed on a first-come-first served basis beginning at 5pm at no extra cost to those wanting to sit on the boardwalk. For safety reasons, only 500 people will be permitted to be on the boardwalk at one time. Will I be able to get into Lee Wenner park on the 4th of July? Lee Wenner Park will be closed beginning at 10am on Friday, July 3rd through midnight on July 4th. The entire park including the boat ramps and parking spaces will be off limits. DO NOT launch your boat and park overnight. All vehicles left in the park after 10am on Friday the 3rd will be towed at the owners expense. Can I bring a pop-up tent? Yes. Can I bring fireworks to set myself? No personal fireworks, or flaming batons will be permitted at the event. If you have them, Cocoa Police will confiscate. Are there any street closures associated with the event? Yes, Harrison Street from Delannoy Ave. to Riveredge Blvd. will be closed beginning at 10am. Will I be able to reach Leisure Services on the 4th of July with any questions regarding the event? Staff will be out and about getting the event set-up and ready to go. They will check messages from time to time but the best way to reach Leisure Services that day will be by e-mail at lmoody@cocoafl.org. Did we miss a question? Post your question in the comments section and we will get it answered right away! The Cocoa Boys and Girls is one of 30 branches that are part of the Boys and Girls Clubs of Central Florida (BGCCF). This organization has helped inspire hope and opportunity in those who need it most - at-risk children in our local community. The Boys and Girls Club of Brevard provides a safe place to learn and grow for over 400 children between the ages of 6 and 18 in our community every year by offering youth development programs to meet the diverse needs and interests of their members. Seventy-three percent of families served by the BGCCF have household incomes of $30,000 or less and 60% of members live in single-parent households. The mission of the Boys and Girls Club is to inspire and enable all young people, especially those from disadvantaged circumstances, to realize their full potential as productive, responsible and caring citizens. Their core values include: Be Safe, Be Fun, Be a Team, Be Caring and Be Great! The Formula for Impact is a road map the Clubs use to ensure that members achieve the priority outcomes of academic success, good character and citizenship and healthy lifestyles. It incorporates high-yield learning activities, targeted programs, regular attendance and the five key elements for positive youth development. For every $1 invested in the BGCCF, the club is able to generate $17.81 of positive economic impact in the community by leveraging funds. Each year the Brevard clubs hold a Face of the Future fundraising and awareness breakfast. The City of Cocoa is happy to participate in this breakfast to show support for an organization that makes such an impact in our community. There is a wait list for the Cocoa club, so every donation is a step forward in getting more kids to become members of the club and get them in a safe environment that will foster learning and growth. For info on the BGCCF and how you can donate, contact (321) 301-4483.